I Am Pro-Life Because of My Mother | My Journeys Through Life . . . Herding Cats In New Mexico! My mother also had an unplanned, unmarried pregnancy, me. In her case, she and my dad married, and were together until his death nearly 36 years later. However, in an era when society judgement often caused parents to force there daughters to give up babies like me, my grandmother told my mom that she’d help raise me, if my mom didn’t want to marry. My parents were 17 and 18 when they married, and my mother hid her wedding ring under my dad’s class ring so she wouldn’t be thrown out of high school in her senior year. I love my mom and dad and miss them very much, and am very thankful that my grandmother ignored societal judgement in the 1950’s when girls were made to marry, have an illegal abortion, or give their baby away. I am, and always will be, unabashedly anti-abortion. One of the most popular debates of our day is the pro-life and abortion topic. 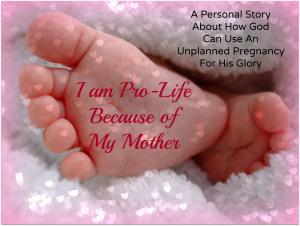 I must declare in honor of Mother’s Day that I am pro-life because of my mother. In 1982 my mother came home to her parents expecting a child. She would become an unwed mother at the age of 20. After living away from home for some time, she humbled herself and asked if she could come home. My grandparents received her back home declaring they would make lemonade out of life’s lemons.